Engadget and InformationWeek are reporting that AndroLib, which gathers all kinds of statistics on the Android Market, pegs the number of Android applications in the store at 100,000. My question is: where are they getting that from? It’s true that AndroLib estimates the total number of downloads has now exceeded 1 billion apps, like we reported a couple of days ago when AndroLib launched a redesigned website featuring the estimated number in near real-time. And as InformationWeek pointed out, that number is climbing fast, by 100,000 in the time it took their reporter to write his post. But 100,000 total apps available in the store, as both state? Not just yet. 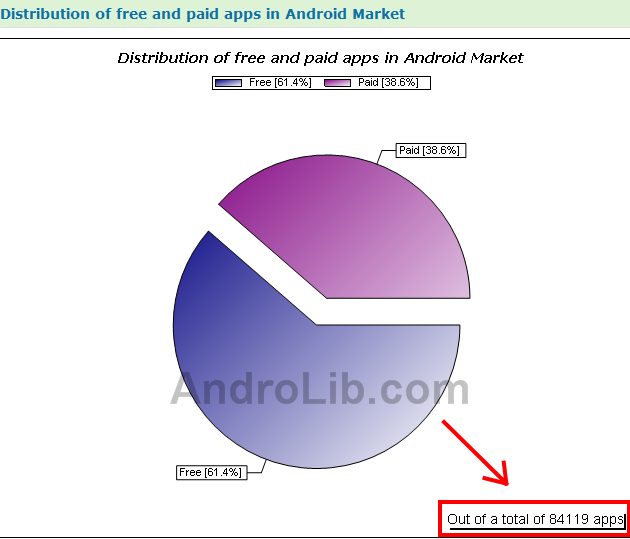 AndroLib also keeps a neat page of the distribution of both free and paid apps in Android Market on this page, where they say the total number of apps in the store is just above 84,000, much closer to the number Google itself shared yesterday in its earnings call (>70,000 apps). Still a discrepancy, but not by as big a margin as Engadget reports. Update: AndroLib says they measure Android apps published throughout the world, and that Google probably kept a nice round number for their earnings call – and they also think they may sometimes count apps that have been recently removed from the Market. AndroLib also claims the number of available apps sometimes grows by 1000+ per day. So will the total number of applications in Android Market soon surpass 100,000 in total, like the guys from AndroidGuys predicted earlier this month? Yes, almost certainly, in the next few weeks even. But again, not just yet.